This is my first blog. Probably my last too but this race made me feel strongly enough to write about it. I may witter on. Consider yourself warned. I entered St Oswalds within a week of DNFing Hardmoors 110. I was hungry to get a 100 mile race under my belt and felt my DNF was an unlucky combination of factors I could avoid next time. St Oswalds had always been top of my list and it fitted perfectly over the September weekend that Hardmoors 60 was on that I was no longer interested in running, now that I was out of the Hardmoors Triple Challenge. The first hint of unease came when I tried to find out about checkpoints. Friends on twitter who had done the race before had told me there were plenty of checkpoints, about every 6 miles, but all I could find on the website were checkpoints spaced very far apart. I sent an email and got a reply listing checkpoints every 10k or so and a place name next to them. This was great but one of the checkpoints listed on the website was not in this email. I replied asking for clarification but never heard back. I asked my twitter friends and one of them kindly emailed me with a description of the checkpoints. Very helpful, but I also needed more detail. I dropped it, had other stuff to think about at that time and didn’t follow it up. A couple of weeks before any race is when I really start to focus on it, thinking about where it is, the terrain, pacing and what my plans and aims are for the race. At Lakeland 50 I used a pacing card I had copied and adapted from Joe Butler which worked really well. It has the checkpoints listed on it, distance between checkpoints, total distance to each checkpoint and the time I am planning to arrive at that CP and the subsequent average pace I need to maintain in order to get to that CP by that time. This is not cast in stone, just something to aim for and even if pacing is way out (as it was when I fell and hurt my back at L50) it is still a useful tool to be able to get out and see what distance it is to the next picnic table and gives me the ability to recalculate timings etc. So I send another email asking for clarification. Also Joe asked me to enquire whether the two drop bags we were allowed would be returned to us. By this point Joe and I had agreed he would run it with me rather than just crew me, something I would be very thankful for later. Whether or not drop bags are returned is crucial to know. Does one only put disposable items in it or can one put a spare pair of shoes or clothing to give you more options to adapt to conditions during the race. Again, zero response. I was pretty annoyed by now but a day or two later an email was sent out and at least one of my queries was answered; drop bags would not be returned. The description of water, sweets and coke at every CP until Warkworth was alarming and depressing. Joe and I made sure we had plenty of food in our drop bags but they were 47 miles into the race and I was hoping like hell that, as someone said, “oh there’s bound to be more than that at the CPs”. I think I really did go into it thinking no one would only offer jelly babies for that distance. I had decided to travel up to Northumberland by train, remembering what pieces I was in after HM110 and it also allowed me to return home a day earlier as I wouldn’t need the extra night’s rest in order to drive back after running for 24 hours. Joe was also going to take the train which meant we were relying on taxis to ferry us about. I don’t like this reliance on others for transport but decided it was better than doing all that driving. It also meant I had to get some poor taxi driver to pick me up from my lodgings at 5.15am as the coach taking us to the start from the nearby finish hotel departed at 5.50am. Oh no wait. Here’s an email, the day before the race, to say the bus is now departing at 5am. Great. I didn’t need that extra hours sleep anyhow. Some explanation would have been nice, which local friends in the know supplied saying it had something to do with the thunderstorms the night before. Hmm. My humour level has descended to “pretty narked” by now. However, we get there in the end, I managed a power nap on the bus and a beautiful day was dawning over the pretty Holy Island where we were to start. It was lovely to see the newly (and secretly) wedded happy couple Emma and Ryan; Mark, Keith and Glenn (“the Boyz”) and to finally meet Tricia and Johnny. Johnny and Sarah were spending the weekend running around the area and had kindly offered to meet and cheer us on and help in any way they could. I hadn’t seen Sarah for ages so it was lovely to catch up with her. I do love my twitter friends and feel very lucky to have met so many top people. And so to business. I have my usual panic when I try and load a course onto my watch (it takes ages, then freezes and nothing seems to happen but somehow if I’m patient when I press start, it works) and after the usual RD briefing I pay absolutely no attention to, we are off. St Oswalds is certainly an amazing course and threw multiple terrains at us. To begin with it lulled us with a beautiful castle-lined coastline; we came across gorgeous beaches and quaint villages. Comparable to Hardmoors 60 but without the steps – we thought we were onto a winner! Despite the course elevation profile only showing 5,500 ft over the whole 100 miles, once we had crossed the causeway it certainly started out pretty lumpy. We knuckled down, concentrating on getting some miles in the bank and the first 10 miles went pretty quickly. As expected, the first little CP was water only which was fine. At the 12 mile CP there were a few jelly babies and I was tucking into my chia flapjacks by this stage. I really don’t want sweet food in the early stages of an ultra – to me jelly babies are a life saver when all appetite has gone and you can just nibble on them. Hey ho, off we go looking forward to the first main CP in Bamburgh, thinking there’d be more substantial food on offer after 30kms. My knees were really hurting for some reason and running down hills was very painful. Joe was also complaining of his legs aching more than they should do at this stage but we put our aches down to my undertraining over the summer and his 100kms run back and forth across the Humber Bridge 4 weeks earlier (I know, don’t ask). Approaching Bamburgh we met Chris Randall, another face to put to the twitter profile and it was nice to have a little chat with him and compare notes. He was doing the 50k and looking forward to a pint at the end. Having done a small loop inland, coming back towards the coast Bamburgh Castle tantalised us as it appeared and disappeared behind hills and sandy bluffs but eventually we caught it and saw the welcome sight of Johnny and Sarah waiting for us under the castle. Sarah had the most amazing sight in her hands I had seen so far, however, and she passed over the packet of salt and vinegar crisps. Heaven. They lasted about 5 mins, 4 mins 55 seconds longer than they should have done but I was taking care not to inhale crumbs, something I can assure you is not a pleasant experience when running. To my dismay the Bamburgh CP was yet again water and jelly babies only. Sarah gave me another packet of crisps to take with me and we moved straight off down the coast. This was very pretty and we came across beautiful golden beaches and little sandy coves. We passed through little fishing villages and this part strongly reminded us of Hardmoors 60 and we wondered how our friends Kirk, Dennis and Nigel were getting on there. The pain in my knees had disappeared, as had Joe’s achy legs, and I suddenly realised that with the hot day our salts must have been low. At the previous CP to Bamburgh I had not bothered to mix up Mountain Fuel in my bottle which would explain why I was low on minerals. Doh! I made sure not to skip it for the rest of the day. So on we went, settled into a good ultra rhythm of running and walking the hills. It might not have been speedy but we were both mindful of the miles ahead, and assured ourselves that we were going to finish this no matter what and that we were there to encourage each other when one was going through a low patch. I have no shame in telling Joe to slow down when we get to a road section, as being the speedmeister he is, he naturally zooms off when back on his natural habitat of flat tarmac. Ever onwards, we pass through a village where I buy a very fetching fuchia pink visor as the sun glare was very harsh, and another one where I buy some Pepperonis – I am really hungry now (having scoffed all my onboard food already) and we finally reach Craster and the 50k race finish. Surely there’ll be food here? No. However that Pepperami has had an unwelcome effect on my tummy so am relieved (in both senses of the word) to find loos. Sarah and Johnny meet us again, and again supply us with life saving crisps. It was great to see Tricia finishing and we were rather envious of the 50k finishers all tucking into pints and settling down to enjoy the rest of their day. Off their feet. With food. Are you sensing a theme here? Food. I also took the opportunity to put some time into my feet. All ultra runners know how essential it is to look after ones feet. I have two issues to look out for. My little toes get squashed and then they swell and then they get more squashed. And the soles of my feet basically start screaming after a certain amount of mileage. My toes are dealable if I wrap them up so at Craster I put a huge blister plaster on the one complaining the most and the usual hot spot under my big toe. All comfy and ready to go. We started to realise many people were suffering with the heat and were dropping out. So in the heat and the sun our pace quickly dropped into the familiar ultra shuffle and we adopted a run/walk strategy that worked well. We passed Boulmer, Alnmouth, commenting on how many golf courses and caravan sites we were coming across. Warkworth was stubbonly refusing to get closer but at last, come dusk, after dreaming about cheese for many miles, we came into the pretty town of Warkworth and the first drop bag point in a lovely cosy cafe. Ironically it was also the first checkpoint they offered proper food: delicious soup, brownies, bread, tea etc, even a super helpful volunteer who offered to take anything we wanted to the finish, despite rules saying no drop bags would be. It was a welcome respite and I quickly wolfed down a big tub of cottage cheese (my new not-so-secret ultra weapon), soup, chocolate brownies and the essential cup of tea. Headtorches on (dark so early now!) we were looking forward to turning inland and the change of scenery it would bring. The terrain now changed to rutted and muddy field tracks and we watched in awe as a huge blood red moon rose above the town we had just left. Navigation was fairly easy at this stage; handy red and white tape was normally in a good position and the tracks went on for long enough that the map could go away for a spell while we ran. Approaching Felton is where we started to encounter cow strewn fields, with steep ups and downs, wet boggy grass and ankle turning divots. Combine that with navigating across a pitch black field, trying to find the correct point to exit the field whilst nervously keeping an eye on the eyes blinking at us in the dark, made the going very tough and slow. Always having to stop and check the map is frustrating and now that the sun had gone down the temperatures plummeted too and it got very cold. The organisers had thoughtfully put reflectors in such a way that you could navigate from one to the other quite easily. The only trouble was having got used to this we then found several were missing, or broken, and some had just been turned in the wind so that they didn’t reflect in the right direction. Crossing fields with barbed wire fences and/or hedges means you need to find the right point to get across which can be tricky when you cannot see visual references because of fog or darkness. At one point we entered a field and the path looked like it could be followed simply enough. But halfway across the field was a new fence. Not on the map. The path clearly crossed it but there was no stile or way over. We saw two headtorches pause at the stile into the field but then they continued along the road to where there was a bridge over the river and a road that then nearly paralleled our route north of the river across the fields. Joe suggested we do that but on checking the map there was no way of crossing back over the river before Rothbury and it would have meant going much further. Not what we wanted. We needed to stay south of the river. The field we were in had the river as one of its boundaries and I found that the new fence, right where it ended on the river bank, had a small section of rails that we could climb over. Very carefully, very gingerly, with a pitch black fast flowing river inches away it was not a place to slip. Fog also rose and made visibility tough. When some miles took 30 minutes you know you are in for a long slow one. Joe was getting very tired and I was anxious to get him to the large checkpoint at Rothbury as soon as possible. He even fell asleep on a stile while I quickly ran up a fence line looking for a way over. The map was telling me we were at a point where the path diverged; the left path took an old railway line straight into Rothbury and the right path wiggled down to the river through fields. We needed to be on the railway line which was just over the fence and across a thick bit of copse but I couldn’t find a way across. We climbed a wall but only found a huge chasm that looked too hard to get down – I assumed the railway line was at the bottom. We climbed back over and two more headtorches appeared in the fog and with some relief I turned to them explaining my problem. We all agreed we couldn’t go that way so continued down the hill and eventually found another way over to the railway line. It was a relief to start jogging again but by now Joe was really struggling and literally falling asleep on his feet so we slowed to a walk. I grabbed his arm and dragged him onwards, trying to talk to him and cajole him to the CP. If he had passed out and gone over there is no way I could have got him back up again. We eventually got to the 100k mark at 2am and Joe immediately went to sleep on a padded bench seat. Someone kindly put a space blanket over him and I concentrated on getting us some hot soup and food and started sorting through our drop bags. But I got very concerned when I looked over and saw the space blanket shivering. I was straight over, kicking some poor bloke off the comfy seat next to Joe and waking him up, forcing him to change into the warm dry clothes he’d packed into his drop bag and eat some hot soup. I was horrified to see, when Joe took his waterproof jacket off, all he had underneath was the tech t-shirt he’d worn all day. No wonder he had got so cold and, as we subsequently discovered from the paramedics, the tiredness was the body starting to shut down. Big trembles were still going through him as we discussed the fact he didn’t feel able to carry on and I must continue without him. 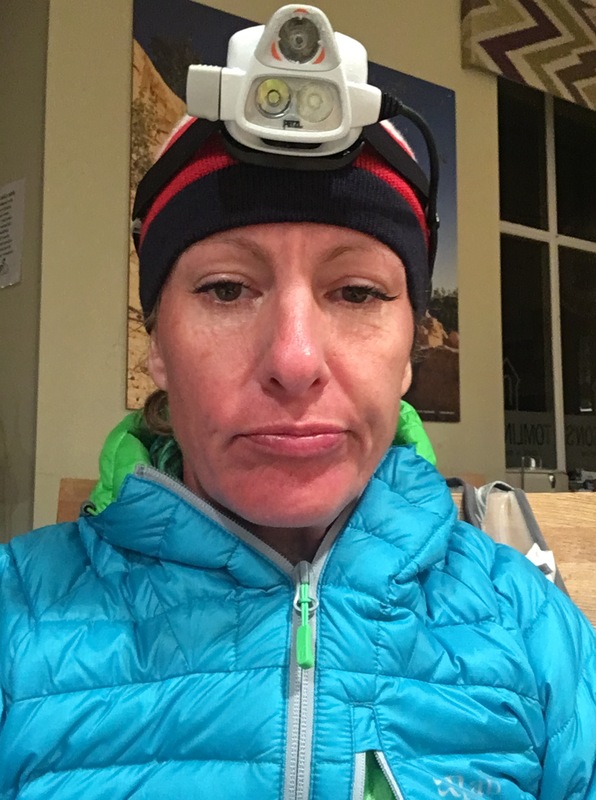 I knew carrying on was the right thing to do – I still had some running in me but I found it very hard to leave my running partner behind and I was also anxious about travelling alone through the night in such conditions. A couple were just leaving and Joe suggested I ask if I could join and they very kindly said yes. So off we went, into the cold fog, passing the incoming paramedics who looked after Joe. Out of Rothbury straight up and onto moorland. Moorland? Yes, somehow I was transported in time and having slogged up what felt like a small mountain, I was back on Bloworth Crossing, the scene of my previous DNF at a 100 miler. Thankfully I was still running and had on good gear so we were able to move fairly quickly across this bleak windy landscape. My feet, having been excruciatingly painful, were feeling better (I reckon it was the wet freezing grass in the cow fields that numbed them) and a body scan showed remarkedly little was complaining. After a quick introduction (David and Vicky) and explanation of why I was leaving Joe behind, we all fell into silence as we ran, shuffled, stopped to scratch our heads over which way next and generally stumbled our sleepy way across the moorland. The full moon, made hazy by the fog that still lingered even up there, cast an eerie light over everything and the heather and stone still did their best to trip us up. My headtorch battery had run out when I was still with Joe, probably because I had it in full Super Nova mode and it subsequently gave up after 5 hours. So I then had to put ordinary batteries in it, in a less bright mode which I found rather dim. A few hours of this and at around 5am I realised the dimness was the batteries running out again, not just my dodgy eyesight. However running with complete strangers, having thrown yourself at their mercy because you don’t want to be alone, puts you in an awkward position. Having gone from being in charge of navigation I was meekly following the others (keeping an eye on the map to make sure they weren’t going wrong of course) and I didn’t feel comfortable asking to slow when I needed to take off my coat, and then again when I needed a wee. So when I realised I needed to change my headtorch batteries you’ll probably all roll your eyes when I say I didn’t want to ask for another stop to change them and so I continued on, trying to use the light from the full moon and the torch light from another bloke who had joined us and was just behind me. We had by now entered Harwood Forest and the going was really tough and we were completely slowed to a walk as we picked our way round bogs, sedge grass, logs and all manner of things doing their best to trip up sleepy runners. Not being able to see properly really wasn’t helping matters but my brain was addled and I was too worried about asking for another stop to realise a quick stop to change them would have made my life so much easier. I continued to urge the sun to hurry up and just as we exited the forest itself and emerge onto the tracks between the trees the sunlight was enough to see by. Relief. However, the slow picking our way across the forest floor had taken its toll and everyone remained walking a slow plod and the distances between us grew as we all slowed. I put my down jacket on but the cold still crept in, in its usual sly way. My eyes started drooping and I mused how it had taken this long for sleep to catch up with me and decided that concentrating on navigation really helps focus the mind and sleep just hadn’t got a look in. Now however, following the others in a sheep-like fashion, I was suddenly absolutely exhausted. My feet were screaming again and my walk resembled that of a party goer at 5am in the morning after a good night out. Ah those were the days. I was in misery. The pain in my feet was like walking on hot coals. The miles had been wonky throughout the race (the gpx track from the website stated 104.9) and my mileage was a good 6 or 7 ahead of that advertised at each CP. So despite my watch approaching 80 miles travelled, it was still saying 30 miles to go. I calculated how long it would take me to finish and the answer clashed with my train home. I even thought about dismissing the train home, finding someone to take my daughter to school the next day and continuing no matter how long it took. But the pain in my feet wouldn’t go away. I was in company that, despite the kindness, was strange and above all I simply didn’t care enough about getting to the end. I was miserable, in pain, to all intents alone and this is not what I wanted. It was another 5 achingly slow and painful miles to the next CP. I spent every second wishing it over. When I saw a van at the end of a long track ahead I burst into tears of relief. This is not what running is about for me. It brings tears to my eyes just remembering it. I refrained from throwing myself at the feet of what turned out to be an ambulance crew in charge of the CP and just stood there crying and shaking my head. Vicky was struggling with the cold and had been bundled into the front of the ambulance to warm up – they were not letting her leave until her temperature rose from where it was at 35°. David very kindly offered to give me a piggy back to the finish (! my own friends refuse to do this for me) but I was adamant about my decision and was given a seat in the back of the ambulance. I immediately contacted Sarah and Johnny, who I knew were planning on coming to see us at the finish so hoped they were near enough to possibly rescue me. I had had some contact with Joe after I left and now discovered he had been transported to the finish at Chollerford but was otherwise stuck so he was rescued at the same time. I shall always be hugely grateful to them for that, as well as the crisps. I’m not sure yet which was more important. I’m not one to say never again. Who knows what lies over the horizon. But I have decided that for now 100 milers are not for me. Many out there are able to dig in, grit their teeth and continue into the pain regardless. I can’t because the end result isn’t more important than the pain I am going through. And frankly death marching for 30 miles is simply out of the question to me. So I accept that I am not up to it now. I love the 50-60 mile distance that is runable the whole way, that doesn’t destroy my body or make me question my mental strength. I love the mountains and the variety of pace and scenery that comes with it. I have learned that what keeps me going is a passion for my surroundings and discovering new places. I love navigation, working out where I am and where I need to go; it keeps me focused on the now, not worrying about later stages of the race. Perhaps I should have been brave enough to leave that CP alone – it might have given me the focus to drive forward instead of merely following. But I am not one to dwell on what ifs. It is what it is and can’t be changed and valuable lessons are still taken forward. So in essence I would say a fantastically tough course; for my purposes it was badly organised this year but I know plenty who would love it so yes, I would recommend it. But not to novices like me: only to those hardy souls who I admire and respect enormously – the 100 mile runners. I hope this isn’t your first and last blog – the long form suits you. It will be interesting to see how you feel if you read this back in 6 months time. I do think you’ve got a 100 miler in you but as you say you have to want it enough. The route does look like something I’d enjoy but I might read a few more race reports before I sign up. Wow, I’m drained just reading this. A fantastic read with a real insight into what goes through an ultra runners mind. You’ll remember that day/night for the rest of your life very time you eat a packet of salt & vinegar crisps. Your writing is honest and very descriptive, please write again. Happy blogging 🙂 and really well done. Great blog article. 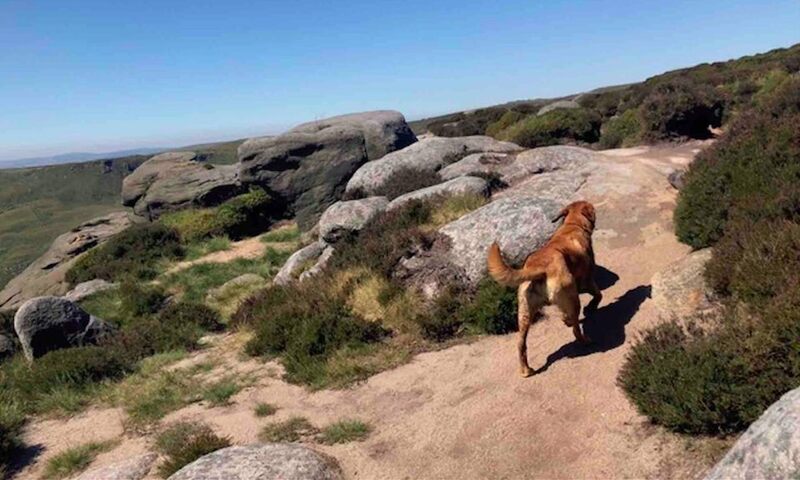 So much of what you said rings true to me (Dave – as in David and Nicky who you ran with over the moor). We were just as concerned about the food situation as you were. It’s a running and eating sport isn’t it? Or have I got that wrong? With only a week to go on finding out that there would be combinations of water, banana and Coke at each checkpoint required some last minute changes to food strategy and mental preparation. This wouldn’t have been such a big issue if the drop bags were to be taken to the finish. Again, change of strategy. The idea of spare tops, socks, shoes etc just in case a change was required could not be entertained unless you carried it or were prepared to throw it away. Mild panic a week before! Oh, and the last minute bus time change was annoying as it meant 1 less hour of sleep. Matters weren’t helped by getting stuck in traffic and missing the Friday briefing. Having said that once the event started it was well organised, marked, picturesque and the cp’s were well run with friendly people. I agree it’s probably not for a first timer. These things make it a different type of event where there is more reliance on self sufficiency. Just would have been nice to know when we signed up for it. Improve the pre race communication a bit and it would be a really good event. You should know that it was a pleasure to have you join us. You were running well across the moors. If there’s one thing you need to take away and that’s to speak up if you need to sort something out. You’re the number one priority. Everyone else is secondary. We absolutely would not have minded stopping for a few minutes while you sorted your torch. That probably goes for most people. Apologies for not noticing your low light issues. I have no doubt that you are absolutely capable of completing a 100 mile race at some point. In this case you probably would have missed your train had you carried on (we finished after 1500). That clearly played on your mind. Well done for having the strength to carry on without your running partner. The easy option would have been to retire at Rothbury. Instead you ploughed on through the night. All good experience. In the end, 80 miles is still a massive achievement. Good luck with your future races. Dave! How lovely to hear from you! Are you on twitter? I’m so glad you finished but goodness I wouldn’t have had the strength, mental or physical, to have continued as you did. Thank you for your kind words and for letting me run with you. Yes I should have said something but you know, these things grow out of context in your head and stupid decisions are made. Not that it made any difference to my race anyway. You have my utmost respect for carrying on. I emailed the RD about lack of communication leading up to the event and said exactly what you did – if we had had prior knowledge before entering about lack of CP food and drop bags being returned it may affect a decision to enter. I have been scorned by others for this, but some people need food and its not fair to insinuate they aren’t hard enough to do it otherwise. Ooops NICKY not Vicky – sorry!